In the last two decades, cosmology has become a data driven science. Several observational probes of the Universe, such as the cosmic microwave background, the large scale distribution of galaxies, the weak gravitational lensing of galaxy shapes, the mapping of supernovas and the number of clusters of galaxies are being studied by different experiments to explore fundamental physics describing the nature of dark matter and dark energy. 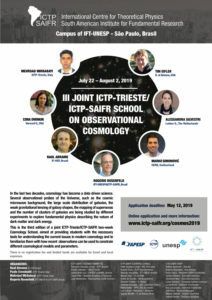 This is the third edition of a joint ICTP-Trieste/ICTP-SAIFR two-week Cosmology School, aimed at providing students with the necessary tools for understanding the current issues in modern cosmology and to familiarize them with how recent observations can be used to constrain different cosmological models and parameters. The program will be available by the end of June, 2019.